Most Internet applications use sockets to implement network communication protocols. TCP/IP Sockets in Java: Practical Guide for Programmers, with its focused, tutorial-based coverage, helps you master the tasks and techniques essential to virtually all client-server projects using sockets in Java. Later chapters teach you to implement more specialized functionality; incisive discussions of programming constructs and protocol implementations equip you with a deeper understanding that is invaluable for meeting future challenges. No other resource presents so concisely or so effectively the exact material you need to get up and running with Java sockets programming right away. 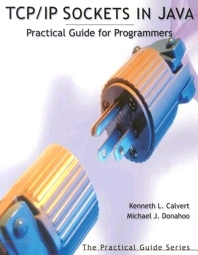 For those who program using the C language, be sure to check out this book's companion, TCP/IP Sockets in C: Practical Guide for Programmers. Perfect for a practitioner who may even want just to "look into" this technology. Provides tutorial-based instuction in key sockets programming techniques, focusing exclusively on Jva and complemented by example code. Covers challenging sockets programming issues: message construction and parsing, underlying TCP/IP protocol mechanisms, Java I/O, iterate and threaded servers, and timeouts. Includes references to the relevant Java class libraries that often go beyond the "official" Java documentation in clarity and explanation. Kenneth L. Calvert is an associate professor at University of Kentucky, where he teaches and does research on the design and implementation of computer network protocols. He has been doing networking research since 1987, and teaching since 1991. He holds degrees from MIT, Stanford, and the University of Texas at Austin. Michael J. Donahoo teaches networking to undergraduate and graduate students at Baylor University, where he is an assistant professor. He received his Ph.D. in computer science from the Georgia Institute of Technology. His research interests are in large-scale information dissemination and management.